Okay, pards...here we go with a bunch of western reviews which I hope you'll like. I've got over 300 westerns in my collection (counting just feature films, not TV productions) and I'll keep reviewing as long as you keep enjoying them. Saddle up! 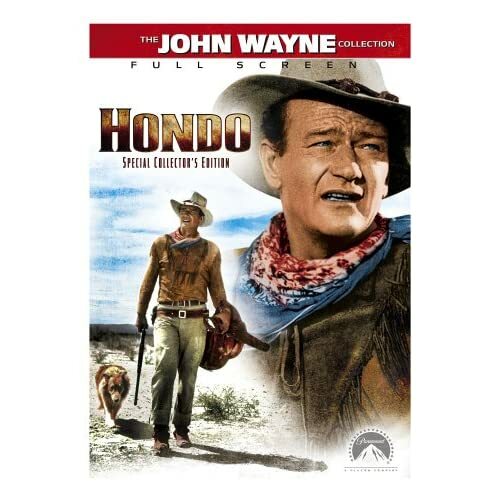 Hondo (1953) 83 minutes. Directed by John Farrow. Music by Emil Newman and Hugo Friedhofer. Based on the novel by Louis L'Amour. It seems only fitting to start a western marathon with a John Wayne movie. This movie was actually filmed in 3D, though the craze was pretty much dieing off by the time it was released. There aren't too many obviousl 3D moments in it...the credits obviously have that look and there are a few times in fights where a knife or other weapon comes in at the camera. Luckily, it's an excellent western as well. The story was by Louis L'Amour who first had it published as a short story and then expanded it into a full-length novel. Leonard Maltin, who provides an on-screen introduction, tells us the novel was the first published by L'Amour under his real name. As with most Wayne westerns, there's lots of familiar faces. 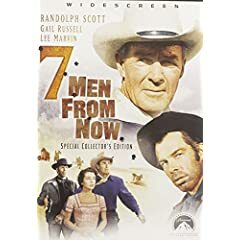 Ward Bond has a key role and James Arness is in here, too, two years before he would become Matt Dillon. Paul Fix has a supporting role as does Leo Gordon (the guy John Wayne slugged to start the big mudfight in McLintock!) but there are a few people here who weren't Wayne regulars...Geraldine Page makes her film debut (earning an Oscar nomination for her efforts) and Lee Aaker is her son (he was the young boy in the Rin Tin Tin TV series). The storyline has Wayne coming to the woman's ranch after losing his horse, accompanied only by his dog Sam (played by Lassie). The small ranch is deep into Apache territory and they are about to go on the warpath because of a broken treaty. Hondo (John Wayne) stays on while he breaks a horse enough to ride, helping her out during his brief stay. Later on, he winds up killing her surly husband in self-defense but it doesn't keep the two from falling in love. The Indian uprising comes to a head, especially after the death of the tribe's original leader (who had been friendly to the two) and the new leader is much more antagonistic (and who Hondo had defeated earlier in hand-to-hand combat). This film is a good example of a movie not needing to be well over two hours to be entertaining. It's not even a full 90 minutes long but it keeps things moving quickly and still has time for some quiet moments. I liked the photography and the score, surprisingly credited to two composers. Picture and sound are excellent, as you would expect from a major studio release. Older movies, especially westerns, don't tend to get lots of extras when released on DVD but this is an exception in that area. Besides the intro by Maltin, he also provides an audio commentary and is joined there by western historian Frank Thompson and Lee Aaker who had played the boy, Johnny. There's also a making of short, a profile of screenwriter James Edward Grant, a piece on Ward Bond and (something I always want to see) the original theatrical trailer. I give this classic western 4 big yee-haws! Looks like one I will have to add to my collection... huh Roger? I am saving Open Range at this point... want to do a Kevin Costner double feature of it with Wyatt Earp when I get it. Oh yeah... I am sure Roger would be telling me to get them all! Yes ,you definitely need to get Hondo. It's a no-brainer. Hondo seems like something to add to my colleciton too. So far I only have John Wayne in The Cowboys and Rio Bravo but feel I could do with more. Roger, I happen to see the cover above shows "Full Screen". Is that just because you copied the file form Amazon or do you own the Full Screen version? Not only is the Full Screen version the only available R1 release, but according to a review at DVD Talk it appears to be the proper AR for this film, apparently cropped to 1.85:1 for theatrical release. Yes, Hondo came out the same year as The Robe, the film that really started the widescreen movement. Since Hondo was originally shot in 3D, also shooting it in widescreen may have been too difficult. I'm not even sure why they put "Full Screen" on the cover when that is the way all copies of this movie should be. The next review is of a Hopalong Cassidy movie. I have many Hoppy films...I have 8 DVDs of double-feature Hoppy films from Image (which is what the below review is from) and I have 8 other volumes that stuff 5 Hoppy films per disc. Those are from Platinum, a company not known for high quality releases but their Hoppy discs are pretty good. Hopalong Cassidy Returns (74 min. ), finds Bill on his way to Mesa Grande, where he is the new Marshal. Along the way he stops a runaway horse and saves a woman's life. Upon arriving in town, he discovers his old friend, the town's newspaper editor, has been brutally murdered by the very same woman Hoppy just saved, a hardnosed businesswoman who runs the town. There were "A" pictures (major films like Stagecoach) and "B" pictures (low-budget moves such as Buck Jones and Tim McCoy would make) and the Hoppy movies were "B" westerns...but a cut above most of the other B's. They put a bit more money into them, show on locations instead of the usual sets and the extra money showed. Also, they were often longer. Most B westerns ran just about an hour but the Hoppy movies ran as long as 80 minutes. Gabby Hayes had been in the first Hoppy movie as Hoppy's uncle, but his character died. They wanted him back so they cast him again as a different character, a friend of Hoppy's named Windy. This episode has a few unusual touches, including a female criminal and a man bound to a wheelchair...he is the friend of Hoppy's who is attacked just before Hoppy and his younger brother get to town. This movie is part of a double-feature disc from Image (they did 8 of these double-Hoppy releases) and the quality in picture and sound is outstanding. The only downside? Hoppy kisses a girl. Ewwwwwww! Cast: Randolph Scott, Gail Russell, Lee Marvin. The basic plot: A former sheriff (Randolph Scott), haunted by the loss of his wife in a Wells Fargo robbery, hunts for the seven men responsible for her death. Along the way, he assists a couple travelling west from Kansas City to California, and is forced to deal with another former outlaw (Lee Marvin) he had once sent to prison. This was an excellent film. The excellent cast included Gail Russell as the wife of the man driving the covered wagon that he meets up with. The director, Budd Boetticher, is one often associated with Randolph Scott and they made several superior westerns together. Burt Kennedy wrote it and Andrew V. McLaglen, who directed many John Wayne movies, served as one of the producers. The film was made by Wayne's own Batjac company. The DVD has an excellent crisp print that shows off it's fine color photography (the film being shot by another Wayne veteran, William Clothier). It moves along crisply though still has time for a few quiet moments. I'm mainly familiar with Miss Russell from her films with John Wayne (including the underrated Angel and the Badman) but she is quite excellent here as well. Lee Marvin is menacing in an early role without being over the top. And of course, Randolph Scott is properly heroic and shows an inner fire of a man bent not only on justice, but on revenge. DVD extras include an audio commentary, documentary on Budd Boetticher, profile of Gail Russell and the original theatrical trailer. 300 westerns...and I thought my mom and step dad had a lot of them. This thread may give me ideas for more westerns to get them. I think they have Hondo...I'll have to check. Are you also using DVD Profiler to catalog your DVD collection? Especially since you apparently don't feel that urge to neatly catalog each and every item in your collection you may be better off leaving it this way.